These white chicken enchiladas are definitely worth trying they are so simple to make and super delicious. 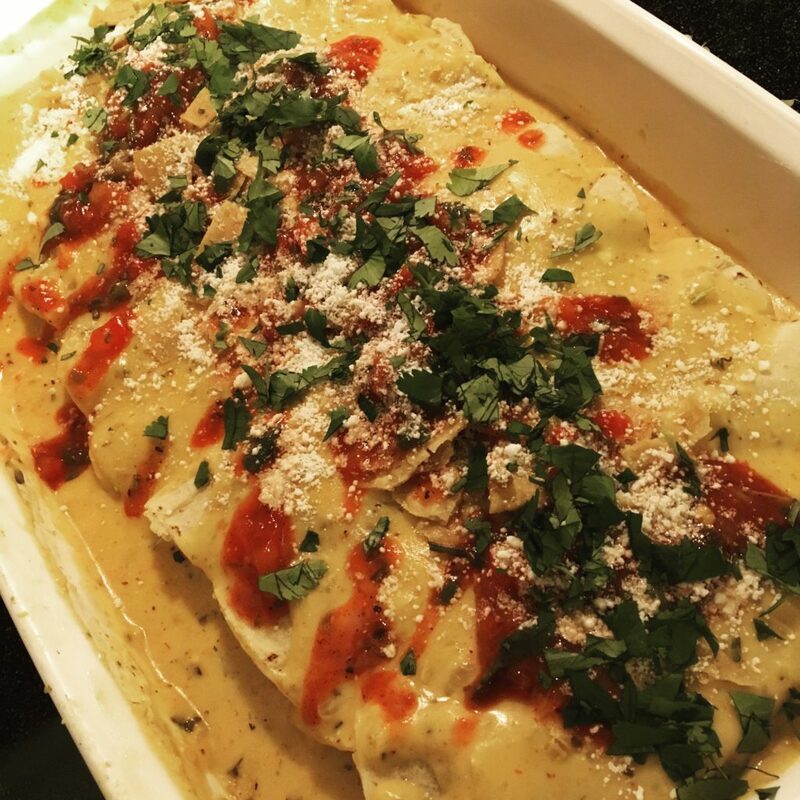 I’ve used this sauce recipe as a base for so many other enchiladas dishes and even queso. For Easter brunch, I substituted chicken for scrambled eggs and it was phenomenal. I made it the day before and it reheated so well, it made for such a stress-free morning. Any hoo, enough about brunch, let’s talk about the original recipe. First, let’s review the list of ingredients you’ll need. Heat olive oil in a skillet and add onion, garlic cube until fragrant. Add shredded chicken and season the mix with Mexican seasoning, cumin, salt, and pepper. Squeeze in whatever citrus you have like orange, lemon or lime juice; I prefer all three. Mix, sautee and set aside. If this combo sounds familiar it’s because it’s essentially my Cuban Citrus Chicken recipe. Pre-heat the oven to 350 and let’s start on the sauce. You’ll need to make a roux first to do so melt butter and add a dash of olive oil to the skillet. I’d also recommend adding another garlic cube, diced onion, and jalapeno to the skillet. Next, you’ll want to add a pinch of flour and stir it in, add a few more pinches until the mix starts to look a bit like brown cookie dough. That’s a roux and what will make your sauce thick and creamy. Add about a 1/2 cup of milk and stir in cheese a little at a time so it doesn’t get too clumpy and the cheese melts evenly. Splash in some cream, pour in about half a cup or more of salsa, Mexican seasonings and if you want to kick up the heat add a little Mexican hot sauce as well. Once you’re happy with the flavor you’ll want to remove it from the heat or turn it down low enough it won’t burn while you’re rolling up the enchiladas. I like to heat up my tortillas in a skillet with oil before I begin to roll them. I usually add a little more cheese along with the chicken or whatever filling I’m using and roll it up with the sides open. Place as many “roll-ups” as you can in a baking dish and then pour your sauce on top. Top with a little more cheese, a drizzle of hot sauce, cilantro, jalapenos, whatever suits you. Cover the dish with foil and put it in the oven for about 30 minutes. Then remove the foil and continue to bake for another 10 minutes. Let cool and serve.